Charlton’s 1-1 draw with 10-man Southend saw them unable to gain anything from a weekend when Pompey and Sunderland also drew. The three sides who are chasing Barnsley and Luton all had to take only a point in the League One promotion battle. Bowyer’s men missed a big chance with their draw at home to Southend. The manager was not happy. Wingers Tariqe Fosu and Mark Marshall were criticised by the manager. He told South London Press and Mercury: ‘It’s tough to take. ‘We got into the final-third so many times but our balls into the box were not good enough. The two wide men, their end product wasn’t good enough. Bowyer was adamant his team should have got the victory. In his view Southend were fortunate. As it was it took Ben Reeves’ second-half equaliser to rescue a point for Charlton at home. The Shrimpers led courtesy of Stephen Humphrys’ deflected 22nd-minute shot but were a man down five minutes later as Dru Yearwood was given his marching orders. Doncaster came from behind to grab a 3-1 win over Peterborough and make former boss Darren Ferguson's return to the Keepmoat Stadium one to forget. George Cooper put Posh in front early but the game changed after the visitors had Tyler Denton sent off in first-half stoppage time for a second bookable offence. 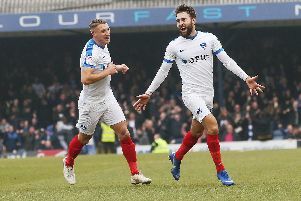 Matty Blair headed a 62nd minute equaliser and further goals from John Marquis and Kieran Sadlier made it a miserable afternoon for Ferguson. Bottom club AFC Wimbledon remain adrift after goals from Jamie Allen and David Templeton saw visitors Burton cruise to a 2-0 win. Second-bottom Shrewsbury earned a point in a 1-1 draw at fellow strugglers Bristol Rovers, Shaun Whalley putting the Shrews ahead in the first half before Alex Rodman's header spared the home side's blushes. Shrewsbury had midfielder David Edwards sent off five minutes from time. Paddy Madden’s early strike was enough to give Fleetwood a 1-0 win at Bradford, while a goal in each half from Chris Wallace and Harry Pritchard steered Blackpool to a 2-0 win over Walsall. Jordy Hiwula scored in the 68th minute to give Coventry a 1-0 victory at Rochdale, while goals from Kyle Wootton and Kevin van Veen saw Scunthorpe to a 2-0 win over Accrington Stanley, who have now failed to score in five games.